Richard N. and Joan K. Ostling, Mormon America: The Power and the Promise. Harper San Francisco, 1999, 454 pages, ISBN 0-06-066372-3 (paperback). Balance. Perspective. Valuable and rare commodities in the market of religious exchange. The husband-wife team, Richard and Joan Ostling, weave both throughout their book Mormon America. This may be the best general introduction to the Church of Jesus Christ of Latter-day Saints available today, in part because it has so much to offer — both to members and non-members of the LDS Church. When it comes to the Mormon Church, Richard N. Ostling is on familiar ground. Now a religion writer for the Associated Press, his 30 years in the field of religious reporting have included in-person interviews in Salt Lake City with current LDS President Gordon B. Hinckley and former President Spencer W. Kimball. While senior correspondent for Time magazine he did much of the field reporting for that magazine’s August 4, 1997 "Mormons Inc." cover story, one of 23 cover stories he wrote for Time. Joan Ostling is a freelance writer and editor and a former writer and editor for the U.S. Information Agency in Washington D.C. The authors’ goal in writing Mormon America is to produce "a candid but nonpolemical overview written for non-Mormons and Mormons alike." A book in which "outsiders will find some fascinating information and want to learn even more. And the insiders will see them selves portrayed fairly while learning some things they would not have know otherwise" (p. xi, all pagination refers to cloth edition). The Ostlings succeed on both counts. Mormons will find out how thoughtful, interested non-members view their church – both its history and beliefs. The Ostlings become the curious neighbors next door, inquisitive about what makes this religion tick. They are open to all that is good and exemplary within the church, but care enough about the truth to seriously investigate its true historical origins and foundational beliefs. Also helpful to non-members is the Ostlings’ analysis of the Mormon Church’s efforts to mainstream itself and become accepted as part of the broader Christian community. Many people see only the Mormonism showcased by a carefully woven PR curtain designed to display a good "Christian" image and hide anything that might detract from it.. As an example, the authors refer to the weekly LDS radio/TV program Music and the Spoken Word, which includes music from the Mormon Tabernacle Choir and a brief inspirational talk. "Notably," they write, "the words are carefully void of anything that would distinguish Mormonism from conventional Christianity" (p. xxiii). Mormon America does, however, make it clear that there are significant differences between the Mormon Church and historic Christianity. One of these differences is the LDS teaching on the nature of God – that God the Father was once a mortal man who worked his way to godhood and continues to exist with a body of flesh and bone. "I Wouldn’t Say That …" Or Would I? Educated Mormons are well aware that their doctrine concerning God the Father, particularly the idea that he was once a mortal man and has a literal body, is offensive to traditional Judeo-Christian believers. President Gordon B. Hinckley sidestepped this question in two 1997 interviews. Queried on that point by the San Francisco Chronicle religion writer Don Lattin – "Don’t Mormons believe that God was once a man?" – Hinckley responded, "I wouldn’t say that …. That gets into some pretty deep theology that we don’t know very much about." In a recent conversation I had with two young Mormon missionaries on this subject, they candidly admitted, "Of course we cannot talk openly about our teaching that God was once a man like us. If we started out with that at the door, no one would let us in." When I questioned the honesty of such an approach they replied, "We have to give people milk before meat." 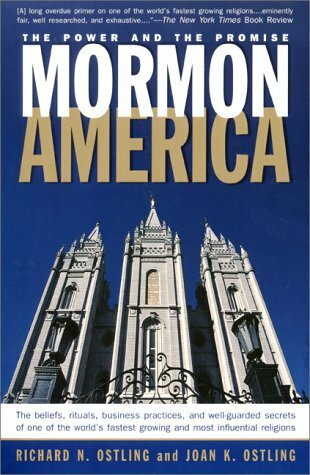 Mormon America delves into all the significant doctrinal facets of Mormonism – God, man, salvation, polygamy, racial discrimination, new books of scripture, etc. – but avoids the common point-counterpoint analysis of arguing one set of teachings against another. Instead, the authors present LDS beliefs within their cultural and historical frameworks, often tracing the development of these doctrines over time. Rather than critique the rightness or wrongness of a particular teaching, they highlight areas of similarity and contrast so the reader both understands Latter-day teaching in context and sees how this relates to his own faith tradition. The authors note that when it came time for Joseph to write about his own history he was "less than forthright, depicting himself as a day laborer hired to locate an old mine, and stating that this gave rise to the ‘prevalent story’ of magic treasure-digging" (p. 25). And though leaders of the Mormon Church keep new converts and even their own missionaries in the dark about Joseph’s occult practices and background, the Ostlings found these facts acknowledged by Mormon historians. But Mormon historian D. Michael Quinn has carefully detailed Smith family activities in ritual magic and ownership of various occult objects and talismans, documenting the influence of this folk religion in early Mormonism. The evidence is too well documented to deny. Another Mormon historian, Columbia University’s Richard L. Bushman, has written, ‘There has always been evidence of it in hostile affidavits from the Smith’s neighbors, evidence which Mormons dismissed as hopelessly biased. But when I got into the sources, I found evidence from friendly contemporaries as well, Martin Harris, Joseph Knight, Oliver Cowdery, and Lucy Mack Smith. All of these witnesses persuaded me treasure-seeking and vernacular magic were part of the Smith family tradition" (p. 25). The authors note that these occult practices carried over even into the translation of the Book of Mormon, as "Smith would bury his face with the seer stone in the hat and then dictate words to the scribe" (p. 26). more than pageants, parades, trail markers, monuments, and restored homesteads. There is a very real sense in which the church’s history is its theology .... And just as creedal churches have official statements of faith, the Mormon Church tends to have official versions of sacred history (p. 245). Therein lies the key to what may be one of the most insightful, fascinating and to some, troubling chapters of Mormon America. For as LDS Church leaders have sought to faithfully preserve their own history, they have succumbed to the temptation to present only faith-promoting history — deliberately omitting, suppressing, altering that which would adversely affect their spiritual and social credibility. Mormon teachers are required to present the currently acceptable, faith-promoting, official view of history, Apostle Boyd Packer said in a famous speech to the annual Church Educational System Religious Educator’s Symposium in 1981. (p. 249). The authors discovered that the LDS Church’s commitment to look good (even if that means re-writing its own history) has affected Mormon scriptures, Mormon teaching materials, and even the Mormon scholars who have attempted to set the record straight.2 Those in the last category have been reprimanded, blacklisted and even excommunicated for their commitment to historical integrity (pp. 248-252). The Ostlings’ commitment to candid yet fair reporting and historical integrity makes Mormon America invaluable to anyone who wants an honest telling of the Mormon story. They couple frank admiration of LDS family values and Mormon commitment to missionary service (there are over 60,000 full time Mormon missionaries worldwide) with equally candid appraisals of Mormon beliefs and history. Mormon America lauds the beneficial aspects of Mormon society, a place where "Mormon people encircle each other in a loving community, seeking to make sure that everyone has a divinely appointed task and that no one’s needs are overlooked" (p. 385). But the authors are also willing to address openly what Mormon Church leaders would so like to keep out of view, e.g. "centralized control, continuing secrecy, regimentation … suspicion toward intellectuals, suppression of open discussion, file-keeping on members for disciplinary use, sporadic purges of malcontents, church education as indoctrination." The Ostlings conclude, "Mormonism still desires mainstream status, but largely in order to foster good public relations and proselytism" (pp. 382-383). Mormon America is valuable not only as a superior source of information on the Church of Jesus Christ of Latter-day Saints, but also as an example of good religious reporting which informs rather than inflames, is characterized by balance and perspective, and is, when necessary, a graceful disclosure. 1. Christian churches teach belief in God as an eternal, self-existent, immortal being, unfettered by corporeal limitations and unchanging in both character and nature. In recent years, several Christian denominations have made studies of Mormon teaching and come to the conclusion that there are irreconcilable differences between LDS doctrine and Christian beliefs based on the Bible. The Ostlings note that the Presbyterian Church (USA) study concluded that the LDS church “is not regarded as ‘within the historic apostolic tradition of the Christian Church.’” (p. 319). The United Methodist Church and Southern Baptist Church Conference have come to the same conclusions, both publishing material on their websites clearly placing the Mormon Church outside the historic Christian community.